Chelmsford City will have to play their football in the National League South again next season, as for the second year in a row they suffered play-off disappointment, Hampton & Richmond getting the better of Rod Stringer’s side who finished the match with 10 men following Jazzi Barnum-Bobb’s second half dismissal. The best chances of the early period fell to City in the 8th and 9th minutes, Scott Fenwick hitting the bar then fellow striker Chris Dickson lobbing Hampton’s on-loan Queens Park Rangers goalkeeper Seny Dieng, the latter of which was tipped over the bar very well. 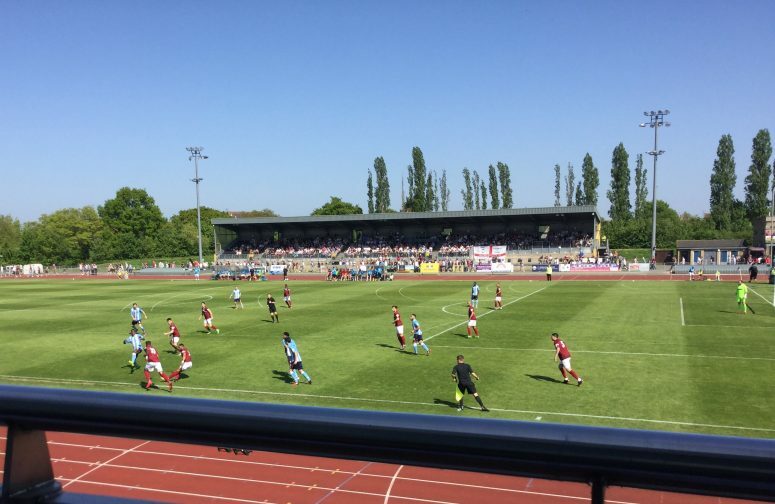 Chelmsford went close again not long afterwards after they won a trio of corners, the first of which was cleared to safety by the Beavers’ Shaun McAuley after Kudus Oyenuga had gone close to putting City in front. Home captain Anthony Church then went close and the third corner was then cleared off the line by Max Kretzschmar. Hampton’s first real chance came on 28 minutes after Brendan Kiernan picked up the ball on the right hand side and passed to Kretzschmar, but the former Wycombe Wanderers midfielder scuffed his shot and it rolled to the right of Chelmsford keeper Jake Jessup’s goal. Clarets had a decent opportunity in the 35th minute when Kudus Oyenuga fired an effort towards goal, but his shot was well blocked. Stringer’s side then won a free kick 6 minutes before half time when Oyenuga was brought down 25 yards outside the box. Michael Spillane stepped up to take it but his effort sailed well over the bar. Then with only a couple of minutes until half time Barnum-Bobb, who had caused the visitors a few problems with his runs down the right wing whipped in a cross for Fenwick, who went close from around the penalty spot but was unable to open the scoring, and so the match remained goalless at the break. Just after the break Hampton made a bright start as Kiernan broke away, running into the box and managing a shot but Jessup managed to stop his strike from going in. Oyenuga managed a strike at the other end a few minutes later, but his shot was fired straight at Dieng who gathered the ball without any problem. But disaster struck for Chelmsford in the 55th minute, when Charlie Wassmer had a shot cleared off the line by Barnum-Bobb but the Clarets’ right back was adjudged to have stopped the ball from entering the net with his hand, and was issued with a straight red card by referee Josh Smith. Kretzschmar stepped up to take the spot kick and made no mistake, powerfully slotting the ball home to Jessup’s right to make it 1-0 to Hampton. The hosts, who had been much the better side until this point now had to face up to playing the rest of the match with 10 men. City boss Stringer made a change with 25 minutes remaining, Johnny Giles making way for one of their stars of last season’s play-offs Bagasan Graham and then on 71 minutes fellow wide midfielder Michael West, just back from a loan spell at Kingstonian replaced the impressive Oyenuga as the Essex side strove to get back into the match. Stringer made a final throw of the dice in the 78th minute but substituted one forward for another, with Phil Roberts coming on for the experienced Dickson. But the match seemed to be drifting away from Chelmsford, along with their promotion prospects, and their one really good chance in the closing stages came a couple of minutes from time when Dieng lost possession of the ball and it came out to Elliot Omozusi, but he fired well over the bar. So it was Hampton & Richmond who went through to next week’s final in which they will be at home to Braintree Town, who ran out 1-0 winners at Dartford in the afternoon’s other semi-final. City on the other hand were left to rue what might have been, following another fine league campaign but which again resulted in heartache just when it really mattered. They were very much on top during the first half and could have sewn the tie up then, but their lucklessness in finding the net and the opposing side’s man advantage for the final 35 minutes ultimately conspired against them. 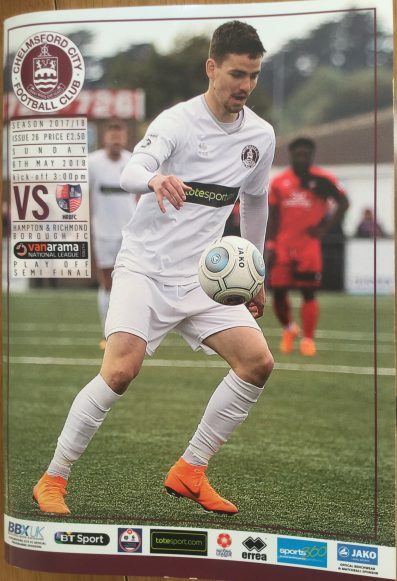 Chelmsford City: Jake Jessup, Jazzi Barnum-Bobb, Craig Braham-Barrett, Max Porter, Michael Spillane, Elliot Omozusi, Kudus Oyenuga (Michael West 71), Anthony Church, Scott Fenwick, Chris Dickson (Phil Roberts 78), Johnny Giles (Bagasan Graham 65). Hampton & Richmond Borough : Seny Dieng, Ben Wynter, Josh Casey, Jack Cook, Charlie Wassmer, Shaun McAuley (James Mulley 76), Max Kretzschmar, Shannon Baptiste, Shaun Jeffers, Brendan Kiernan (Elliott Charles 86), Bradley Hudson-Odoi (Taurean Roberts 71).